Accommodation: The complex features a variety of apartments of various sizes - from small studios to large three bedroom apartments. 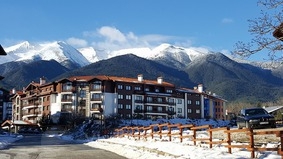 The apartments are furnished first class and offers views of the mountains or the courtyard. Each apartment has a fully equipped kitchen, living room with flat-screen satellite TV, private bathroom with shower or bath rooms sleeping equipment on a bed or twin beds, balcony. All apartments are with wooden floors.